This is a lovely book to either read aloud to little ones, or for older children (or adults!) to enjoy. It is imaginative and well written with lots of adventures without being too scary. I cannot recommend it too highly. I enjoyed this book overall; it was a fun, cute adventure that made me smile as I read it. It was a simple story that told of friendship and perseverance, but not in a way that was too daunting for the young reader. The only thing that got me was that there were a lot of punctuation errors in the actual print. Otherwise, I look forward to the second story! My wife brought this for my daughter from a signing at our local Waterstones. She'd seen me suffer through my 1st/only signing there and took pity on Paula Broderick who looked similarly lonely! Highly recommended! Fantastic book full of adventure! Paula Broderick - I've had a varied life teaching, training and competing with horses; running a successful business with my husband and navigating for him on classic car rallies; owning a game reserve in South Africa, and raising two wonderful sons.I have always written stories and poems. 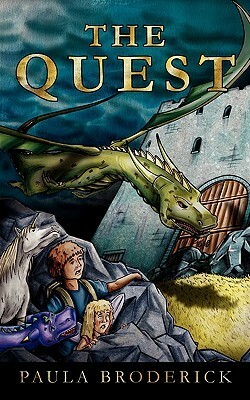 The Quest, published in May 2011, is my first novel. The first chapter of The Quest was originally written for my youngest son. Twenty years later I finally got around to finishing it!I am inspired by children's authors, most noticeably J.M. Barrie, Hugh Lofting and C.S. Lewis. The Quest is suitable for young readers aged seven and upwards, but I often hear from parents, and grandparents, who equally enjoy my fantasy adventures. As a writer this is thrilling to hear.Among my fans I am lucky to count Denise Fitzpatrick, children's author and creator of seven-time Emmy award series Jakers!